'Ek Villian' actor Riteish Deshmukh and wife Genelia D’Souza have become proud parents again of a baby boy. Genelia gave birth to a baby boy in Mumbai today on June 1morning. This happy news came to light when, Ritesish made the announcement on Twitter on behalf of his elder son. He wrote, "Hey guys, my Aai & Baba just gifted me a little brother. Now all my toys are his..- Love Riaan". 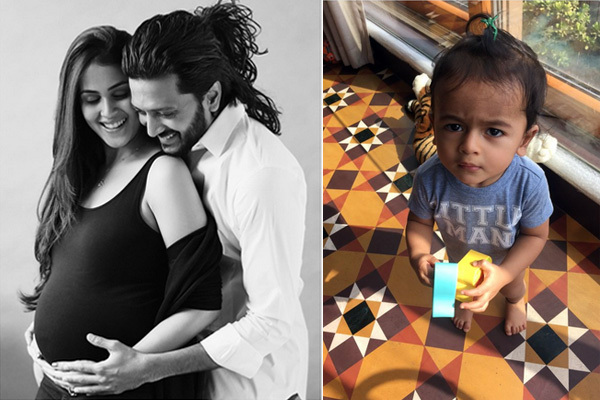 Riteish shared a picture of Riaan with the post. Few days before the delivery, Riteish and Genelia had earlier got a photoshoot wherein Genelia was flaunting her baby bump. She looked gorgeous with her husband in a black and white picture. She captioned the pic saying, "Thank you GOD for blessing me much more than I deserve." Currently, Riteish is promoting his upcoming multi-starrer movie ‘Housefull 3’ that will hit the screens this Friday on June 3. The couple got married in 2012 and had their first baby Riaan in November 2014.